With a name that comes from the Seneca Indians, Seneca Rocks, pictured, is part of the Monongahela National Forest located in eastern West Virginia in Pendleton County. According to the West Virginia Encyclopedia, Seneca Rocks is composed of the Tuscarora Sandstone deposited during the Early Silurian Period approximately 425 million years ago, when sea waters covered what is now West Virginia. 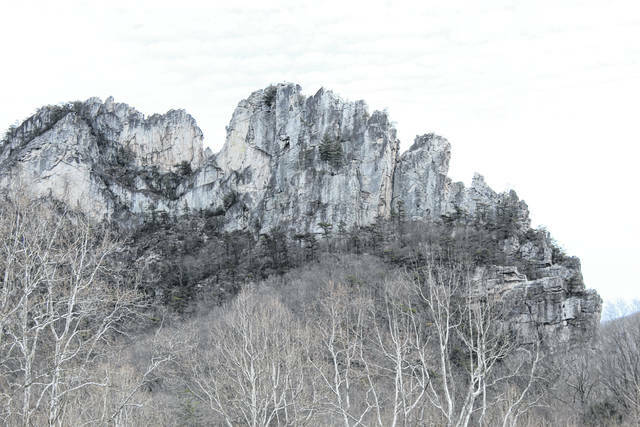 Many, many years later, visitors can take in the Seneca Rocks Discovery Center, do some fly fishing in Seneca Creek, rock climb on formations rising nearly 900 feet, or travel a 1.3-mile trail to an overlook for a view of the rock formations. However, be warned and be ready to climb because that “short” 1.3-mile trail ascends 960 feet.